Armored trains proved themselves well suited to the conditions of the Russian Civil War, which raged from 1919 until 1922. The Imperial Russian Army had fielded seven official armored trains during the First World War, but these were usually used as mobile artillery platforms. The more fluid situations of the Civil War, in which the armies were much smaller and there often were no fixed front lines, brought forth greater use of armored trains. A train can carry an enormous load of weapons and manpower. The typical armored train had an armored locomotive, and up to six cars fitted out as weapons platforms. These had one or two field guns each, plus machine guns. A single train could easily bring a battalion’s worth of firepower to bear on its target. A typical Bolshevik early armored train with two armored wagons had a crew of 95: 24 to work the train itself, and 71 to man the weapons. Russia did not have an advanced automotive industry capable of turning out tanks and armored cars (few nations did in 1919), but the Russian factories that produced locomotives and rolling stock could easily turn their hands to making military trains. 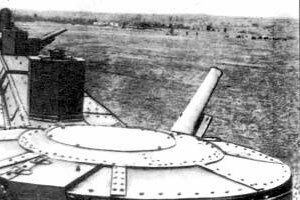 Designs became more sophisticated, with armored turrets for the machine guns and cannon. By early 1921, the Red Army alone had 122 armored trains in service, not counting locally-made improvised versions. Many of the trains carried naval guns ranging from 3-inch to 6-inch caliber, and usually drew their crews from the highly-motivated, pro-Bolshevik crews of the former Tsarist Baltic and Black Sea fleets. The sailors also had a much higher literacy rate than the typical army soldier, and often had technical training as well. Red Army practice teamed the trains in groups of three. A light armored train was armed with machine guns, carrying an infantry company and sometimes even cavalry. The heavy armored train’s big naval cannon provided the fire support. Finally, a maintenance train was ready to deal with the armored train’s greatest weakness: damaged tracks. By 1920 the Red Army was using armored trains in groups, sometimes six or more of them at a time. And on several occasions, armored trains fought other armored trains belonging to the White faction or to the Polish army. The same re-armament plan that brought out a series of new tanks in the early 1930s also called for new, purpose-built armored trains. The standard BP-35 armored train used many components from the tank program (for example, the same 76.2mm turret as the T-35 heavy tank). When the Nazis attacked the Soviet Union in June 1941, the Red Army had 34 light and 19 heavy armored trains, while the NKVD had another 25 armored trains (many of them Civil War veterans) and 36 self-propelled armored wagons (a large locomotive sporting several tank turrets). Armored trains proved themselves extremely useful in covering the Red Army’s retreats during the summer of 1941 — all of the rail lines ahead of them were in friendly hands, and they could unleash their massive firepower from secure locations. Soviet workshops began producing more trains as quickly as possible, and by late September two dozen more had taken to the rails. Two turret-mounted 107mm howitzers of a BP-35 armored train. 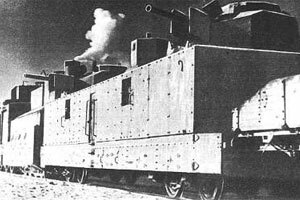 The big armored trains proved vulnerable to German air attacks, and in January 1942 Soviet factories began turning out a new design, the OB-3, with more, smaller wagons each carrying one gun turret or anti-aircraft gun. This would allow the crew to jettison damaged cars without losing as much of the train’s firepower, and their lower profile would make them more difficult to hit. But armor quality was poor (often a pair of mild steel plates with several inches of concrete poured between them) and the weapons were the leftovers from the Red Army’s depots — guns of French and Polish manufacture captured during the Civil War. Twenty of the 65 OB-3 trains built were lost in action. The final Soviet armored train design was the BP-43, a modified OB-3 with real armor and tank turrets from the T-34 production line. Twenty-one of these were built by the end of the war. In the game, armored trains are, of course, limited to movement on railroad tracks. A train can both move and fire in the same action segment, unlike a tank, but otherwise is treated just like a tank. The piece provided in the game represents a smaller vehicle, the M1938 self-propelled armored wagon, and as such can be destroyed by anti-tank fire.